When you are looking for an amazing brew, Moontown Brewing Company is the perfect place for you! From their amazing beer selection to their delicious food, you’ll be sure to leave Moontown Brewing Company happy. The cornerstone of Moontown Brewing Company is their locally-brewed craft beers. They brew everything from brown ales to lagers, and everything in between. No matter what kind of beer you enjoy, you’ll be sure to find your next favorite beer at Moontown Brewing Company. Part of the brewery is the Moontown Brewing Company brewpub. Here, you can get a variety of delicious dishes—ranging from pulled pork sandwiches and burgers to shaved brussel sprout salads. There is something on the menu for everyone to enjoy. You’ll also want to check out the events calendar for fun upcoming events. 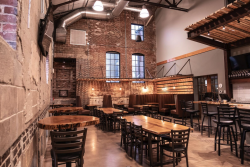 Moontown Brewing Company is the perfect place to grab a beer and a burger, and even catch a fun show! Booking Howl2GO Dueling Pianos’ world class show to your Whitestown, IN event couldn’t be simpler. From conventions to corporate events, weddings to fundraisers, our unbeatable Dueling Piano shows bring a high energy, interactive show that your guests will remember for years to come anywhere in Indiana!